For a few weeks now, we have been receiving non-stopping complains about the ad-supported app that is asking people to fill out surveys to win an iPhone or other rewards. National Consumer Center is a program that possibly collects user information they reveal while filling out these questionnaires. People are easily lured in this scam because prizes are wanted, and it appears as an easy and quick way to profit. There are a few legit services where you can get rewards from questionnaires, but most of these customer lotteries are fake. This pop-up window with the scam message, most likely means that the system is infected with an adware type program. These are known as potentially unwanted and mostly annoying programs that are displaying various commercial content and causing redirects. This program infiltrates the system silently and places various additional programs on the device. Meaning this program can spread other intruders further on the system. 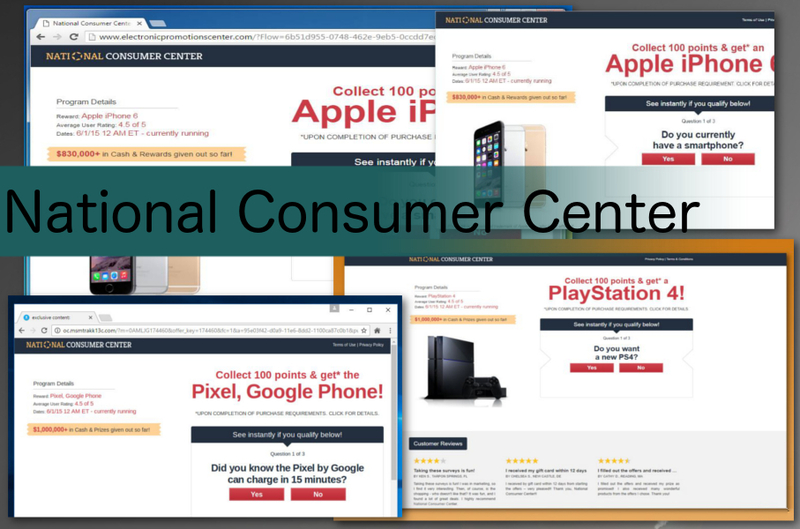 As other similar scams, National Consumer Center lures people with valuable rewards. Apple products, reward cards, and money make people believe this might be a real lottery. If you want to participate in this contest for Samsung Galaxy or other smartphones you need to fill out many surveys. The more you fill out, the more expensive prize you may get. Unfortunately, nobody gets a PlayStation 4 nor an iPhone X, the only thing you can get from this scam is malware. This is pretty dangerous and intrusive advertisements filled with the malicious script are not the most dangerous aspect of this adware program. When filling out these questionnaires, you may be asked to enter your personal information like email address or phone number, possibly credit info. Many people complained about this program in online forums stating that these surveys are never-ending and asking for various questionable questions including personal info. The scam that involves entering any personal information is especially dangerous because this information may lead to privacy issues or even identity theft. At the first sight simple-looking, National Customer Center scam may lead to money loss if you enter any credit or banking information. Be sure that you are not participating in this lottery and take precautionary measures. It is not enough to just exit the window or website that you got redirected to. The best way of protecting your device is proper malware-fighting tools. Anti-virus may protect you, in most instances, but having an anti-malware program on your system is a big advantage. These tools can block potential threats or detect and remove existing ones. It even can identify system vulnerabilities, corrupted files. If you want to be sure these scams are not getting to you, keep these tools up-to-date.